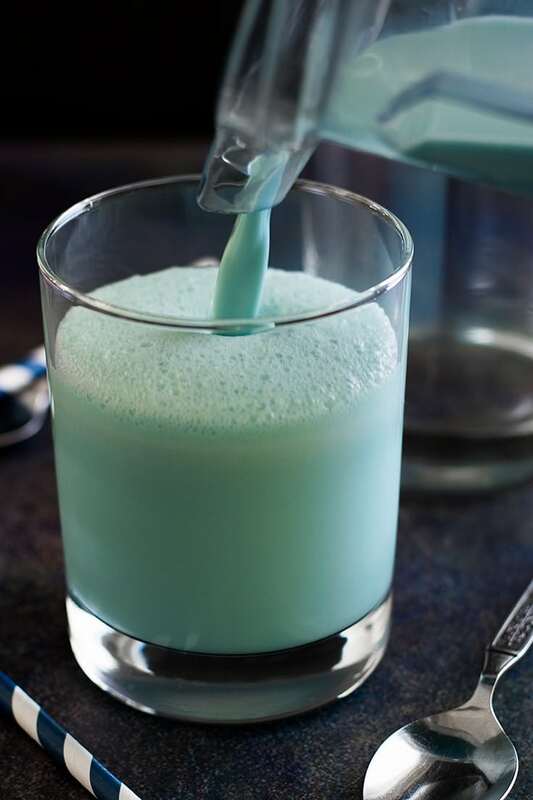 This Frosty Bantha Milk recipe (AKA Star Wars Blue Milk) is super easy to make and perfect for your next Star Wars Party! It’s time for another Fandom Foodies recipe! What’s Fandom Foodies? It’s a fun monthly collaboration where a group of fellow nerdy bloggers all get together and create a recipe based off of a favorite piece of pop culture. (BTW, I’m hosting Fandom Foodies next month and the theme is Game of Thrones!!). This month’s theme is Star Wars, hosted by My Main is a Cook, and I couldn’t be more excited. Star Wars was my very first fandom and it still holds a special place in my heart. A ton of other Fandom Foodies have already posted their Star Wars-inspired recipes; go check them out in that link-up. They are fantastic! I have a couple of Star Wars party perfect treats on the site, my BB-8 Cupcakes and Poe’s Jacket Cookies, and I love, love, love those recipes, but they are both Work. 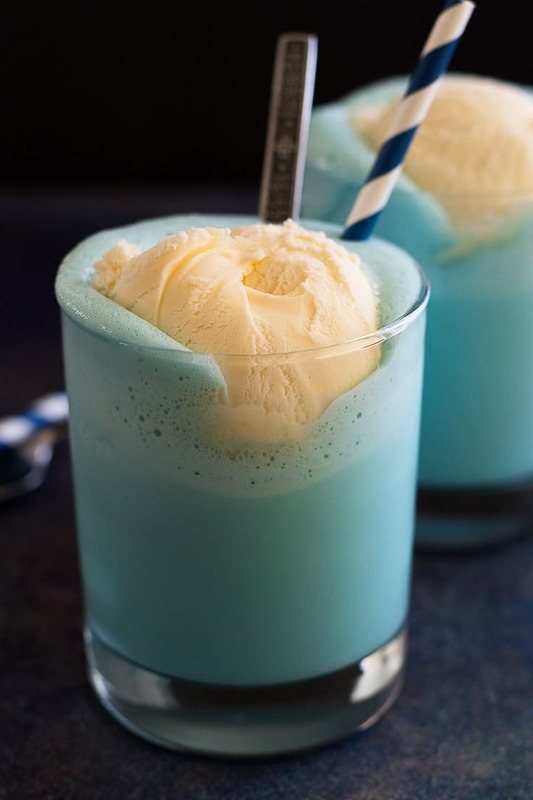 I thought that for Fandom Foodies, I’d post something a little simpler, maybe something with just four ingredients, something like Frosty Bantha Milk! Bantha milk/Blue Milk shows up a couple times in the Star Wars films, most recently in the background of one of the opening scenes of Rogue One. Canonically, bantha milk comes straight from giant yak-looking creatures, but the recipe for my bantha milk is a little more appetizing. 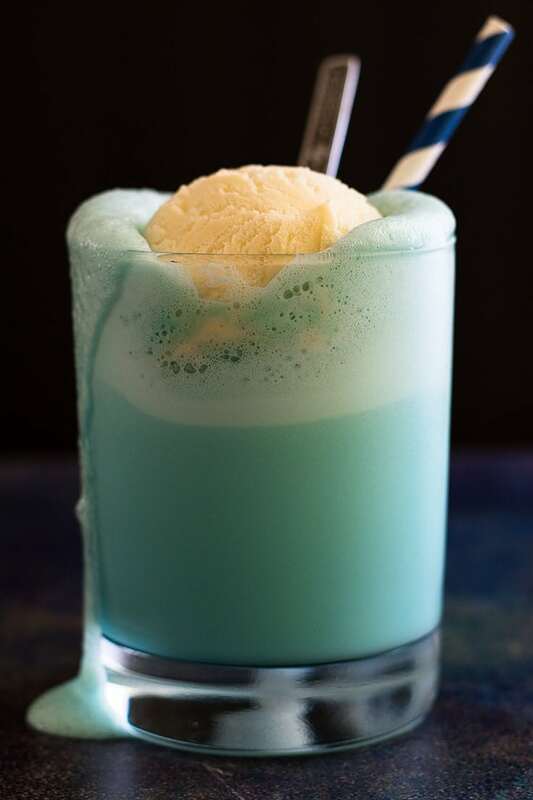 It’s a sweet milk shake mixture of vanilla ice cream, milk, blue drink mix-in like Hawaiian Punch or Kool Aid, and a couple drops of blue food coloring, and it’s preeeeety great. I highly recommend these for summer movie watching parties, because they are FUN, tasty, and so easy. 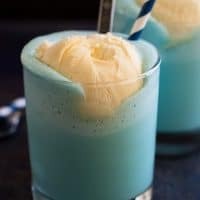 You just blend all the ingredients together, pour into a glass, top with a scoop of ice cream, and easy peasy frosty Star Wars drink. If you are having trouble finding Hawaiian Punch, blue Kool-Aid, or other blue drink mixes, I found sugar-free single-serving packets of Hawaiian Punch in the drink mixes part of my grocery store (you can also find them on Amazon) and they worked great for these. I’m not usually a fan of artificial sweeteners in drinks, but since there’s plenty of sugar in the ice cream the sweetener is not very noticeable. This recipe makes 3 cups of liquid, which is enough for 3 8-ounce or 2 12-ounce drinks. You can adjust the recipe yield by hovering over the serving size (or clicking if you are on mobile) and sliding the slider. 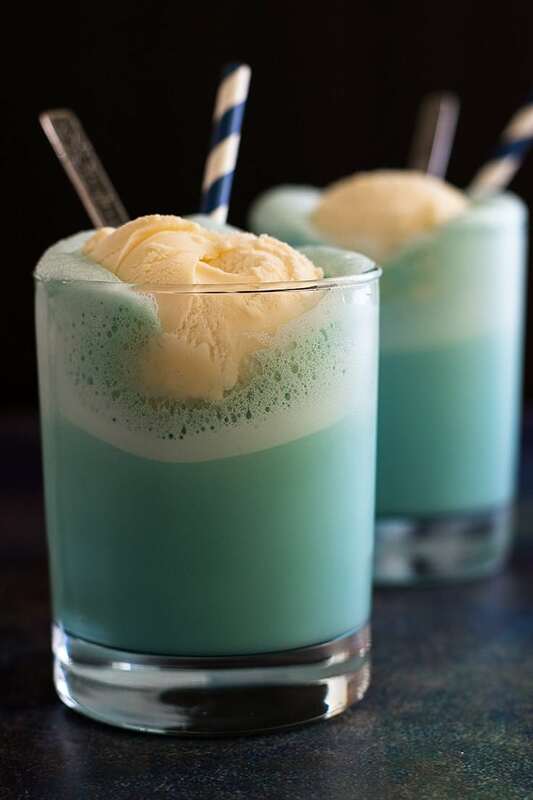 This Frosty Bantha Milk is super easy to make and perfect for your next Star Wars Party! In your blender, combine all ingredients and blend until smooth. Divide between 3 8-ounce glasses and top with a scoop of vanilla ice cream. Serve and enjoy! *If you don't like SWEET drinks, start with half the amount of drink mix, blend, and add to taste.